With the economic upturn, the times of low volume and rationalization are over. Volume is steadily rising for many, and manufacturers are now dealing with a different problem than cost-cutting—how to meet increasing demand after resource cuts and no new investments in productivity improvement in recent years. Now you can meet this increased demand by freeing up needed resources within your current operations. The key is identifying areas of improvement within your existing operations with real-time manufacturing information and accurate, consistent metrics to make improvements in efficiency. 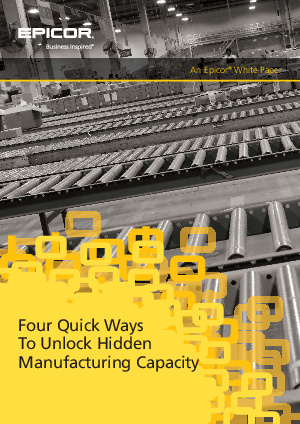 The best and easiest way to find hidden capacity is to examine operations with systems that monitor and analyze manufacturing operations in real-time. These systems provide crucial information to help you find lost capacity, and avoid costly investments for new machinery, additional labor, or contract manufacturing.